WATCH Does a president's age matter? More than a dozen declared and potential presidential candidates are expected to attend the Rev. Al Sharpton’s annual National Action Network convention, the first major gathering of 2020 hopefuls all clearly seeking the support of black civil rights leaders. Sharpton's convention has been a mainstay for politicians, presidential candidates and presidents alike. For many civil rights leaders snubbing the conference altogether is considered a major faux pas. In the nearly three decades since the founding of the non-profit civil rights group, celebrities, civil rights leaders, policymakers and would-be candidates mix, mingle and float ideas to see if they will gain support. Previous attendees of the convention include individuals on both sides of the aisle, ranging from Donald Trump's appearance at the 2002 convention as a part of a ribbon-cutting ceremony to Bill Clinton's 2007 appeal on behalf of his wife Hillary and Barack Obama. Andra Gillespie, associate professor of political science at Emory University, told ABC News "part of the reason why Democratic candidates are reaching out to black voters is that blacks are the most loyal Democratic voting block in the United States." 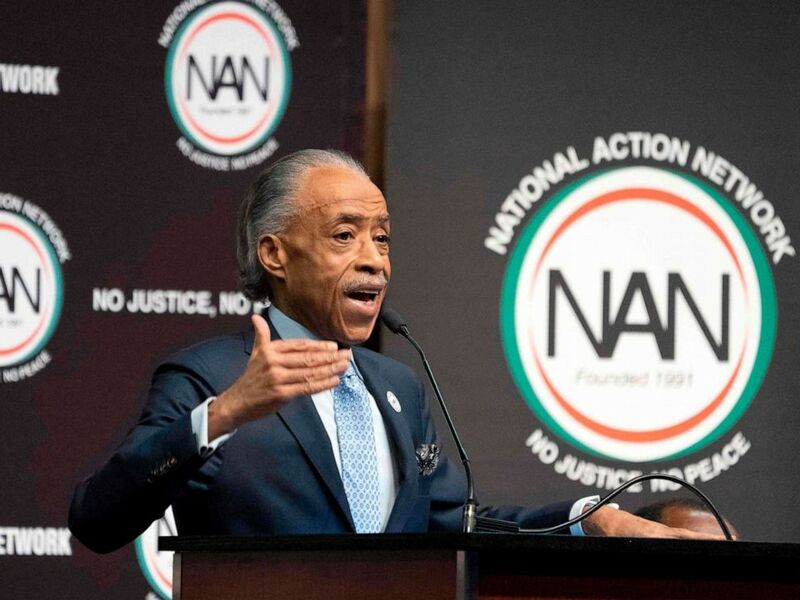 Al Sharpton speaks during a gathering of the National Action Network, April 3, 2019, in New York. African American voters are critical to gaining traction, with the largely Democratic voting base is expected to compose of 12.5% of the electorate in 2020, according to Pew Research Center. In South Carolina, the first primary state in the South, African Americans make up nearly 30 percent of the population. Gillespie noted, "Black voters will play a disproportionate role with helping select the Democratic party nominee for president." In the South, even though African American voters make up a small percentage of the electorate in the general election, Gillespie says black voters make up a majority of Democratic primary voters in southern states. "You need those delegates in order to be able to clinch the nomination." Showing up, Gillispie said, is symbolically important for black voters. So for 2020 candidates targeting black voters is key. Many candidates have gone on walking tours in African-American communities, visited Historically Black Colleges and Universities addressed African American sororities and fraternities and have touted ties to the civil rights movement. Gillispie stresses 2020 candidates who attend NAN, NAACP and Urban League conventions this year are attending in efforts of gaining traction through relationship building. The summer convents "are important convening of black leaders who have political clout" and allows candidates to speak directly to influential leaders in their community, she added. One issue 2020 candidates likely will tackle head-on is the issue of reparations. A majority of declared 2020 candidates have weighed in on the issue. At the convention this year, candidates will undoubtedly face questions on the issue, and Sharpton earlier this week vowed that it would be addressed. Sharpton, who supports reparations, said he feels that it should first be studied to ensure fairness. "I'm glad it's in the presidential conversation. We certainly will be bringing it up this week," he said on Sunday. Sharpton continued urging the conversation to be substantive. Calling on the discussion to "not only deal with repairing what was done in the past but the continued institution of bigotry we see demonstrated every day." Sen. Cory Booker, D-N.J., who will speak at the National Action Network later this week, held a press conference in Washington, where he reiterated his support for Rep. Jim Clyburn's 10/20/30 plan, an effort the South Carolina congressman said aims to help counties that has poverty over 20 percent for over three decades. Those communities would then be required to receive at least 10 percent of federal funds from a specific program aimed at those communities. When asked if it was a form of reparations, Booker, however, declined to comment. Clyburn however said the measure is "absolutely" a form of reparations. Over the past two days at the National Action Network in New York City, 2020 hopefuls have talked about reparations, healthcare, criminal justice reform and other issues targeted towards black voters. Many in the crowd of several hundred people told ABC News that they were still undecided among the wide field of candidates. Denise Hawley, an attendee at this year’s NAN Convention told ABC News that she hasn’t decided on a candidate, "I want to give everyone a chance." She said criminal justice is an important issue for her when choosing who she will support in 2020. Texas native Roy Burn said health care is an important topic. "I don't understand why a lot of our politicians don't believe that every American needs healthcare compared to other western world countries," he said. Burn also told ABC News that he’s thinking of supporting former Rep. Beto O’Rourke, who is also a native of Texas. In New York, some candidates took the opportunity to speak about their civil rights past while others took the time to clarify past comments that raised the eyebrows of African-Americans. South Bend, Indiana Mayor Pete Buttigieg threw his support behind "Black Lives Matter." He had previously said, "All Lives Matter," and clarified his remarks. "What I did not understand at that time, was that phrase, just early into mid especially 2015, was coming to be viewed as a sort of counter slogan to 'Black Lives Matter,'" Buttigieg said. At the time, he said, he didn’t know that the phrase was being used to "devalue" the BLM movement.